Our shopping cart is currently not available. If you have any questions, please contact us on our Contact Us page. Thank You! If you are a professional athlete, or a week-end warrior, Liftag Sport’s Genesis™ Hydrolyzed Beef Protein Isolate is the perfect protein supplement to bring your performance to the highest level. You will build muscle, increase endurance, build strength, and enhance performance. The product has been designed and developed for any athlete and any sport whether your passion is bodybuilding, cross fit, MMA, football, basketball, soccer, cycling, track and field, tennis, or any other activity requiring a fit body. 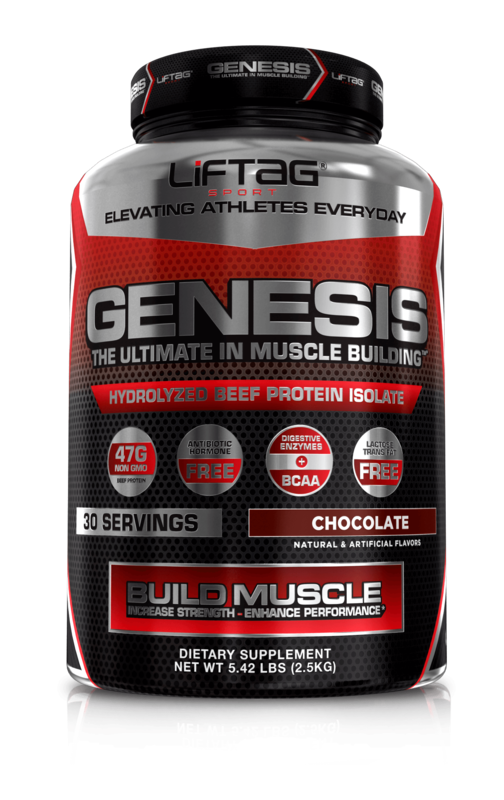 GENESIS™ IS THE SUPERIOR HYDROLYZED BEEF PROTEIN ISOLATE THAT TRULY ADDRESSES BOTH MUSCLE GROWTH AND RECOVERY. OUR UNIQUE FORMULATION IS SCIENTIFICALLY BALANCED SO THAT ALL EXTENSIVELY RESEARCHED INGREDIENTS WORK SYNERGISTICALLY TO ASSURE OPTIMUM UTILIZATION OF OUR PREMIUM QUALITY HYDROLYZED BEEF PROTEIN ISOLATE. OUR GENESIS™ HYDROLYZED BEEF PROTEIN ISOLATE IS DERIVED FROM PREMIUM BEEF STOCK THAT IS RAISED AND PROCESSED IN SWEDEN WITH NO HORMONES AND NO GELATIN. THE PROCESS OF HYDROLYSIS MEANS THE PROTEIN IS BROKEN DOWN INTO ITS COMPONENT AMINO ACIDS FOR FASTER DIGESTION AND BETTER ABSORPTION. 47G OF PURE PREMIUM HYDROLYZED BEEF PROTEIN ISOLATE. PURE PREMIUM GRASS FED BEEF PROTEIN (97%) RAISED & PROCESSED IN SWEDEN. 10.1G OF FULL SPECTRUM AMINO ACIDS: BCAAs – Branched-Chain Amino Acids (L-Leucine L-Isoleucine L-Valine) 7G: BCAAS make up a major proportion of the amino acids in muscle, and stimulate the building of protein in muscle and reduce muscle breakdown. 5G of l-GLUTAMINE: Glutamine is the most abundant free amino acid in the body. L-Glutamine makes a unique contribution to protein synthesis (muscle growth), anti-catabolic (prevents muscle tissue breakdown) functions and growth hormone elevating effects, aiding recovery of muscle cells. 2G OF CREAPURE ® CREATINE Genesis™ contains a full 2 grams of Creapure® in each 100G serving. Creapure® is made by AlzChem in Germany and is widely known to be the purest and finest form of micronized Creatine Monohydrate today. Creatine Monohydrate (Creapure®) has been shown in many scientific studies to enhance performance in successive bursts of short-term, high intensity exercise. Creatine allows athletes to train harder, leading to an increase in strength and build bigger and stronger muscles. Genesis™ Beef Protein has added Digestive Enzymes and Dietary Fiber to assure optimal utilization of protein. Digestive enzymes [Amylase, Lipase and Protease] are unique proteins specially tailored to break down foods into nutrients that your body can then readily digest and absorb. Genesis has also added Fructo-oligosaccharides [FOS], dietary fiber that is referred to as a “pre-biotic” to aid in digestion and stomach health. An energy source that the body makes from food, D-Ribose in Genesis™ may benefit improved energy, workout intensity and recovery, protection for the heart and hormone regulation.